It was directed at Patti Harrison, wife of George. Clapton was trying to lure her away from her husband, with whom he was good mates. That wasn’t widely known when the song appeared in 1970 on the Derek And The Dominos album Layla And Other Assorted Love Songs, but it was certainly obvious to all concerned. Layla was inspired by a book Clapton had been reading, The Story Of Layla And Majnun, the 12th-century tale of an Arabian princess whose father marries her off, leaving her true love in despair that turns to madness. Most of the songs Clapton wrote for the Layla album were co-written with Bobby Whitlock, an American keyboard player who’d recently quit Delaney & Bonnie, a band Clapton had befriended and toured with. But Layla is credited to Clapton and Dominos drummer Jim Gordon, who came up with the lengthy piano coda. Duane Allman, guitarist with the Allman Brothers, was introduced to Clapton by producer Tom Dowd soon after sessions began on the Layla album at Criteria Studios in Miami. According to Dowd, the sessions had been sluggish before he took Clapton to an Allman Brothers concert. Afterwards, Clapton invited the band back to the studio, where they jammed for the next 18 hours. Within days, Duane Allman was playing at the album sessions, transforming the atmosphere as he and Clapton brought the best out of each other. 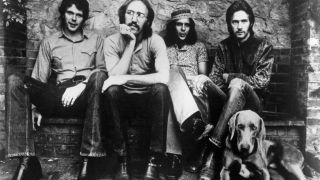 Nevertheless, the fact that Layla gave the record its title and is the climax to the double album suggests that Clapton regarded it as a special song, even before Allman added his masterstroke. Such remarks are heresy to the Allman fan club, but there are reports of an unreleased out-take of Layla that was abandoned because of “tuning issues”. Jim Gordon’s piano coda, added three weeks after the song had been recorded, further irritates Whitlock. “It taints the integrity,” he sighs. “It has nothing to do with the rest of the song. It just sounds like a mess. It’s like Guitar Wars – you’ve got three or four guitars and everybody’s going all over the place.” Whitlock also claims that Gordon stole the piano part from Rita Coolidge, his then girlfriend. It certainly sounds similar to the Coolidge-penned Time, released by Booker T. and Rita’s sister Priscilla in 1973. The piano coda was not on the version of Layla released as a single in the US in 1971, which reached No.51 there. When the full, seven-minute version came out the following year it made No.7 in the UK and No.10 in the US. By which time Derek And The Dominos had been broken up by drug-fuelled paranoia, and Clapton was sinking into full-blown heroin addiction. While Layla has since become the ritual climax to a Clapton concert, it was played live by Derek And The Dominos only a couple of times, when Allman guested with the band. Whitlock says that was just a coincidence. Or maybe not. This was published in Classic Rock issue 1977.